Successfully Added Mirror Alarm Clock with LED Display to your Shopping Cart. Mirror Alarm Clock with LED display. Three setting alarm clock (Time, Date, Alarm) whose face is a highly polished mirror allowing you to check the time while also taking a quick peak at your beautiful self. 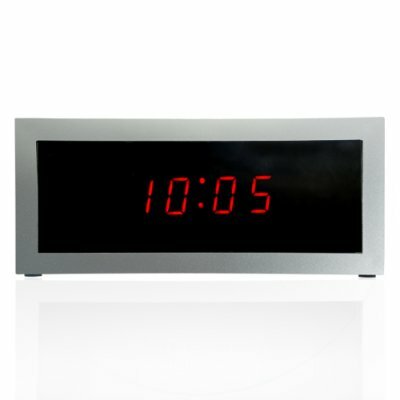 Besides the classy silver finish and mirror surface of the clock, this model has another unique feature to note - you can set it to always have the LED time display ON or only have the time display when you tap or clap near the clock! This makes sure the clock will blend into any environment, whether it is the boardroom or the bedroom. This is a affordable high-tech clock that will last for an extremely long time using only 3 AA batteries, and is a nice gift idea for anyone. In stock and available for single or bulk quantity orders, from the leader in direct from China wholesale electronics, Chinavasion. Mirrored alarm clock in classic square styled housing. Like the mirror very much. Looks pretty good in white room. Almost perfect clock, very stylish. I would like when showing time, to have an option not to change continuously to date and then back to time. For the given price, excellent.